HOW CAN THE BEATING WINGS OF A SNOWY OWL BE QUIETER THAN A BUTTERFLY’S WING BEATS? Several times Hedwig has flown so close that I can feel the swooshing wind around her, but I wondered, why her wingbeats are virtually soundless. I have audio recordings of comparatively tiny Monarchs, whose wingbeats are a thousand times louder than that of Hedwig’s wingbeats. 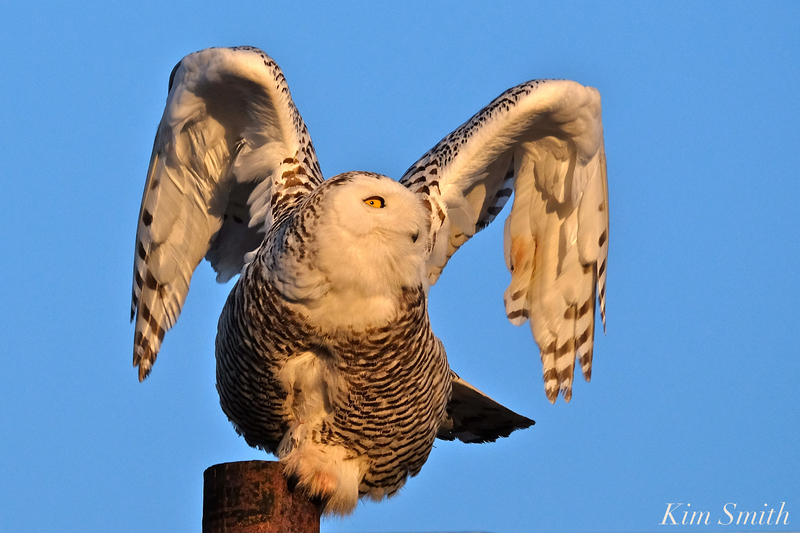 Snowy Owls, like all owls, have evolved with specially designed wings that enable them to fly soundlessly, a necessary feature for stealth hunting of small mammals such as mice, lemmings, voles, shrews, and rats. Their wings are disproportionately large to their body mass, which allows for slow flying, as slowly as two miles per hour, a sort of glide-flying, with very little flapping needed. Additionally, comb-like serrations on the leading edge of an owl’s wingtips break up the air that typically creates a swooshing sound, creating a silencer effect. And, too, the streams of air are softened by a velvety texture unique to owl’s wings and because of the feathery combs of the wing’s trailing edge (see illustration below). 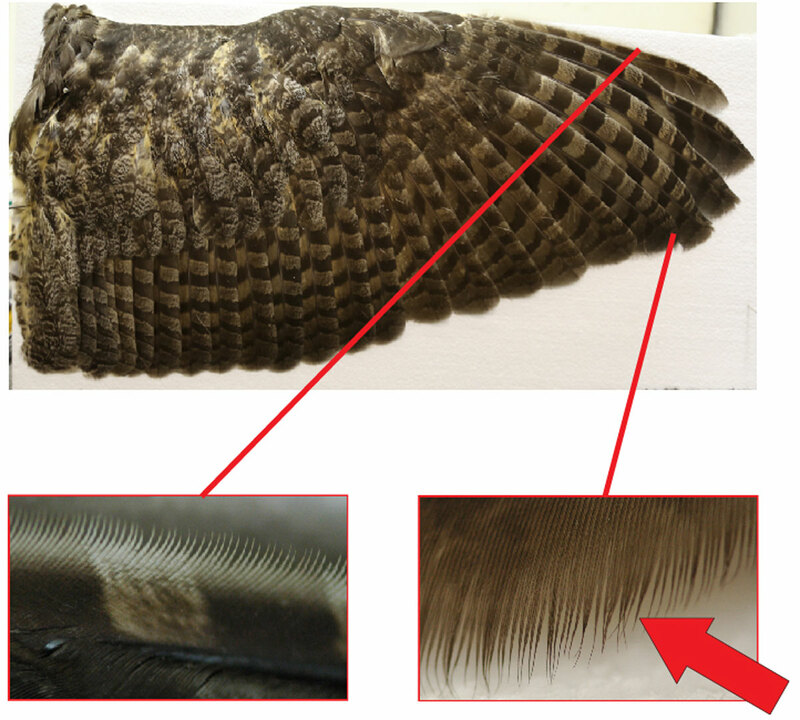 Close-up images of a Great Horned Owl’s wing. On the left, you can see the leading-edge comb; it’s this width that Le Piane measured for her study. On the right, the trailing-edge fringe. Diagram: Krista Le Piane. Image of a Great Horned Owl’s wings from Mass Audbon. READ MORE HERE. This entry was posted in Birds of New England, Cape Ann Wildlife, Life at the Edge of the Sea, Snowy Owls and tagged Beautiful Birds of Cape Ann, Bubo scandiacus, Gloucester, Great Horned Owl, hedwig, Snowy Owl, snowy owl preparing to fly, why are an owls wing beats so quiet on February 23, 2018 by Kim Smith. Thanks for all the education about Nature that you provide!